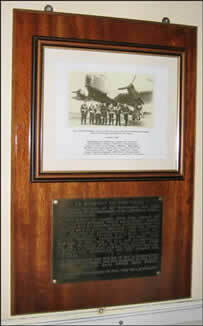 On Saturday 11th June 2005 a Plaque was unveiled in our Exhibition Hall in the memory of the crew of a crashed Lancaster 1 - ME846, PG-C from 619 Squadron at Dunholme Lodge in Lincolnshire. Following training in March 1944 on Short Stirlings at 1661 HCU RAF Winthorpe the crew were posted to 619 Squadron. Whilst on their eighth mission on the night of 21st / 22ndJune 1944 at approximately 01.20 hours BST, their Lancaster was hit by ground fire and subsequently crashed east of Postel in Belgium, near the border with Holland. The pilot, Pilot Officer M A H Davis remained at the controls throughout, allowing four members of the crew to bail out successfully, but he, together with the Rear Gunner, Pilot Officer J E R Bowering and the Mid-Upper Gunner, Sergeant G H Moggridge did not survive the incident. The two gunners are buried at the Schoonselhof Cemetery in Antwerp, Belgium, unfortunately the remains of the pilot and the aircraft have never been found. Forty-six friends and family were present at the unveiling ceremony including two who had travelled from Canada, two from the USA and two widows of crew-members from the Lancaster. The Reverend Norman Taylor made a dedication to the plaque; he is the son of the navigator, Flight Sergeant Leslie Taylor. Production of the plaque and the arrangements for the ceremony were organised by Paul Stevenson who is the nephew of Pilot Officer Anthony Davis [who was known by his crew as Dave]. In the evening Marjan and Jane Knox-Kiepura hosted a buffet-dinner at the Grange Hotel in Newark for the day's participants, Jane being the daughter of the bomb aimer Flight Sergeant Peter Knox. As part of her quest to locate the aircraft and the remains of Pilot Officer Anthony Davis, Jane Knox- Kiepura and her husband Marjan were travelling on to Belgium to meet Kamiel Mertens, who is assisting their search for the missing aircraft. The only crew-member not represented at the ceremony was the Wireless Operator Sergeant Thomas A Newberry [1602063 RAF] and everyone involved in the events surrounding the Plaque unveiling is keen to hear from anyone who can help locate Sergeant Newberry or any of his relatives. Details can be passed on via the museum. "The Plaque Unveiling illustrates the important link that the museum provides to the wartime era of RAF Winthorpe and 1661 HCU”, commented Museum Trustee, Howard Heeley. He continued, "I felt privileged to be part of such an emotional event and I was heartened to witness the strong bonds that exist between the families of the aircraft's crew”. He concluded, "Hopefully the museum can help with the search to locate the remains of Pilot Officer Anthony Davis and to perhaps establish some form of contact with either Sergeant Newberry or his relatives”.